Bakersfield Distribution & the Advantages of Distributing Coffee News! Become a Bakersfield Coffee News® area distribution outlet and gain free local exposure while making your clients happy! 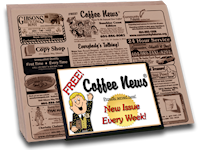 Coffee News® is distributed free to restaurants and other locations through out the Bakersfield area providing a positive diversion for their customers while waiting for their food or services. Maximizing your franchise distribution in the marketplace provides increased readership, resulting in increased visibility for the businesses who advertise. The greater the readership, the greater the value ad rates as a result. Learn how to become an distribution outlet, contact us here.